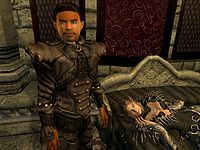 Kithlan, a Redguard noble living in New Sheoth Palace, is Lady Syl's Steward. He seems to be extremely self-centered and possesses a particular dislike for Thadon and Mania in general. He will be quite helpful during the quests involving the House of Dementia and will not hesitate to stab the Duchess in the back should you decide to replace her as part of the Ritual of Accession. His relatively monotonous routine is in symbiosis with that of Syl's servant, Anya Herrick: after waking up at 6am he eats a two-hour breakfast with her in the House of Dementia; leaving then for the throne room. Once he gets there he sits in his chair next to the throne and remains available until 2pm. After that, he joins Anya for an afternoon stroll of the Palace Gardens until 6pm. He will spend the rest of the day wandering around the House of Dementia until his bedtime at midnight. This routine suffers from a few changes during some of his related quests. Once you have located Syl's apparently dormant body during the Ritual of Dementia, he will actively seek you out and inform that it's actually a double. Finally, during The End of Order quest he will remain indoors at all times. His only possession is the elegant black finery he wears. He doesn't wield any weapons or cast any spells, relying solely on his fists in combat. When first met, he will curtly greet you: "I am Kithlan, Steward of Lady Syl. Unless you have reason to be here, your presence is unwelcome." or "Do you have business in the House of Dementia?" Kithlan's position as Syl's steward will prove useful during the Understanding Madness quest; if his disposition is below 70 when you ask him for an audience with Syl he will respond with: "You wish to see Lady Syl, do you? The Lady has refused any and all appointments of late. You'd have to try and find her on your own, and I don't recommend that course of action." If you raise his disposition, he will reveal: "I can tell you that while she stays out of the public eye these days, she does still hold audience in her court during the day. You may attempt to approach her then. The Lady has been concerned about her safety lately, so be prepared for a hostile reaction." Later on, after Syl has started The Lady of Paranoia, sadistic dungeon keeper Herdir suggests that you question the people close to Syl. When you ask Kithlan about a possible conspiracy, he will deny: "No conspiracies here. Go pester someone else." After a painful zap from Herdir, Kithlan will break down and point you towards Anya Herrick: "All right, all right... please, just stop. I don't know anything specific, but Anya has been looking scared lately. More scared than usual. I think something's going on with her. Now please, leave me alone!" You can also leave Herdir out of it and raise Kithlan's disposition to 80, which will make him mention Anya right away: "I don't know anything about a conspiracy, but Anya has been looking extra nervous lately. She might know something more than I do." During the Ritual of Dementia quest, the people of New Sheoth will point you towards both Kithlan and Anya Herrick: "All I can tell you is Syl is rarely seen in public, and her staff takes care of the day-to-day activities. I'd check with Anya Herrick, her Courtier, and Kithlan, her Steward. Maybe they can help you." When asked specifically about Kithlan, they will comment on how his personal experience of his Duchess' paranoia would make him a good ally: "Well, I've heard that recent events in Syl's court have made Kithlan a bit disillusioned with its leadership. But you didn't hear that from me." "Don't be fooled, the Ritual isn't over." Indeed, he will immediately be sympathetic to your cause. After asking: "What is it you require?" Kithlan will, when asked about Syl, admit: "I suppose I should be grateful working in the palace with her, but I can't stand having to constantly look over my shoulder. I don't know if she has it in for me or not. I think she is in constant fear of being replaced." He will, however, not immediately betray Syl: "No! I cannot even think such thoughts. How do I know I can trust you won't become just as tyrannical as she has?" He will then bid you farewell with an odd: "Be wary the shadows." If you raise his disposition above 60, he will prove more cooperative: "Yes, I see you may have what it takes to replace her. Very well, what is it you need from me?" Once you inform him of your need to get up and personal with her he will agree to help: "Hmmm. That may be difficult. Syl has been hidden from public sight lately. However, I can give you something that may help. Take this key. It should unlock any door in her wing of the palace. You still need to be wary of her Seducer guards, but it should help." If you approach him again, he will say: "Please, I have done all I can. There is nothing more to say. Just be cautious." With the key in hand and the added aid from Anya Herrick, you will soon enough find Syl's dummy body in her quarters. At this point, Kithlan will come rushing up to you and say: "Don't be fooled, the Ritual isn't over. The body on the bed isn't Syl, but merely an impersonator. The real Syl uses many such decoys to throw would-be killers off her trail. Syl has made her escape through the hidden tunnel in the gardens outside her quarters! She must not get away! Be wary, I fear that her escape may be a ruse to lure you into an ambush." He will then show you the entrance to Xirethard and resume his usual routine, knowing that he is in a tight spot; if you get near him he will say: "Please, don't continue speaking with me... time is of the essence." If you return to Kithlan after killing Syl, but without taking her heart, he will say: "Your safe return speaks volumes of your success." When you speak with him, he will admit he made a wise decision: "The... the lady Syl has fallen? Can this be? I admit I had my doubts about you, but something told me I was doing the right thing. Many thanks." When you have the heart, he will more or less welcome you to the House of Dementia: "Welcome back, my lord/lady." and "It is my honor to serve you." When exiting conversation he will be relieved: "Finally, no need to sleep with an eye open." Once the quest is completed, Kithlan will say: "How may I assist you, my lord/lady?" and will change his farewell slightly to: "Be wary the shadows, friend." During the Addiction quest for Thadon, you are tasked with finding the Chalice of Reversal. When Thadon explains what must be done, he suddenly gets tired, so you will have to find other persons who can finish the story. Surprisingly, Kithlan will be able to help out, although his position in the House of Dementia will force you to raise his disposition accordingly. When asked about the Chalice with a disposition under 20, and angry Kithlan will say: "You have the stink of Mania about you. Leave before I start vomiting." With a disposition of 40, he will be more willing to talk: "Why would you come to me with Thadon's problems? You think I don't know what you've been tasked with? Why would I help my enemy?" When his disposition is raised to 60 or above, he will tell the rest of the tale: "You think I care for Thadon's toys? It matters not to me whether he suffers in agony, or erases his mind with drugs. But if you insist... Do you know the lengths of his depravity? How low he stoops to pursue his pathetic lifestyle? Felldew is a poison. It kills. And yet Thadon uses the Chalice he created to twist Felldew into a drug he takes for his own amusement. How sick. If he were smart, he'd thank Sheogorath it's out of his hands now. And, of course, he'd never risk himself traveling through Dunroot Burrow to get it." When asked about the Chalice again, he will respond: "I've told you what I will. The Chalice is a corruption. Felldew is a poison, not an amusement. You're better off leaving the Chalice where it is." On the dangerous Felldew Kithlan will explain: "It's a poison, plain and simple. It'll make you wish you were dead. And given enough time, you will be. The Elytra in Dunroot Burrow, the ones that secrete it are immune, but they're the only ones. If the Felldew didn't kill you, the Elytra would. You're better off just leaving the thing in the ruins above the Burrow." When asked about Felldew again he will repeat: "I've told you, it'll kill you. While I don't care if it does, I don't think you want that." If you are Duke or Duchess of Dementia you will have the option to let Kithlan resolve the Brithaur question. 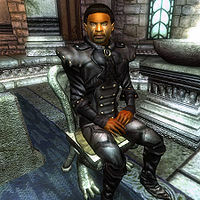 After talking to Earil, thus initiating the quest, Kithlan will assure you that it will be taken care of: "Yes, I've heard of Brithaur's "exploits" in Crucible. Up until now, I thought he was harmless. But now he's become a genuine troublemaker, eh? That's my speciality. Don't worry, it will be handled." This is a quick and easy way to solve the quest and Brithaur will never go to the dungeon. The last thing the Realm needs is one more vagabond sneaking in. The Gatekeeper is dead. One more sign that the Realm is being run into the ground. This never should've happened. The Resonator was my idea, you know. People never remember that, but it was. I'm glad it's working again. Thadon has one less excuse for his sloppy rule over Bliss, now that he has his Chalice again. This is preposterous. Were I in charge, the culprits would've been found and executed immediately. The Great Torch burning again is a sign that things aren't completely hopeless. Means someone is doing something right. I no longer serve Lady Syl. Crucible has a new ruler. Thadon is dead. Bliss will be even more of a mess than before. I helped save the Fringe, you know. Not directly, really, but it was ultimately thanks to me. Rebuilding the Gatekeeper is one of the few things that has gone right lately. I'm not saying I couldn't do a better job, but at least someone is in charge who can get things done. I can say without hesitation that none of this is my fault. Could've told you it was coming, though. You know, of course, that the Realm would still be in jeopardy were it not for me. Kithlan's original name was intended to be Alason. A variable in the quest script for the Ritual of Dementia, set for when Player persuades Kithlan to help, is actually called AlasonTold. There is also a tombstone in the New Sheoth Graveyard that is for an NPC named Alason, but since it is always disabled throughout the game it can never be viewed. The inscription reads: Chappy didn't love me enough to write an epitaph. This page was last modified on 22 January 2019, at 23:45.